V8 Supercar Nissan Altima, Nissan GT-R , and NISMO LEAF RC -"its electric"
I don't think time did anything to anyone ever, other than make them old, so why do all these people want to attack it? In this video, a Nissan Altima V8 rear wheel drive Altima(?) takes on a Nissan GT-R street car, and a NISMO Nissan LEAF electric race car. 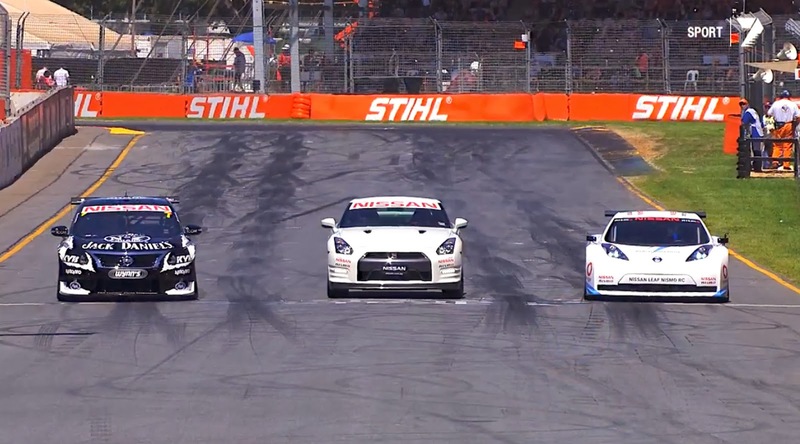 ADELAIDE, Australia – Nissan electrified the track at the Clipsal 500 in Adelaide earlier this month as the Nissan "Time Attack" saw the Nissan LEAF NISMO RC take on the Nissan GT-R road car and the Nissan Altima V8 Supercar. Fresh from his drive of the Nissan GT-R NISMO GT3 at the Bathurst 12 Hour, former V8 Supercars champion Rick Kelly drove the Nissan LEAF NISMO RC. Former Nissan factory driver and television commentator Neil Crompton shared driving duties in the GT-R with young Adelaide racer Samantha Zanotto. And Todd Kelly drove his #7 Jack Daniel's Nissan Altima. The "Nissan Time Attack" supported the opening event of the 2014 V8 Supercars Championship at the Adelaide Parklands circuit where the Nissan Motorsport four-car Altima team battled against its rivals in the manufacturer's second season in V8 Supercars competition. In that race, Rick Kelly took a stunning fifth place finish during a dramatic Race 3.